What is a CSA? It stands for Community Supported Agriculture. It’s a growing movement where consumers can purchase a share in a farm in order to get their food direct from the farmer over the growing season. It’s an awesome way to ensure that you are supporting your local economy, and cut out the middle man to ensure your money is going to the right place! The CSA Alberta website has listings of farms involved in the CSA movement – for Northern Alberta, Central, South, Edmonton and Calgary. It’s not a comprehensive list, but it is a good place to start. Located near Tofield, they grow over 35 types of vegetables, and also have a few beehives for pollination and honey production. They grow as ethically, naturally, and organically as possible. Located north of Edmonton, this small family farm grows Beyond Organic produce, and also offer pastured eggs from chickens, ducks and geese, as well as pastured pork, lamb, goat, free range chickens, ducks and geese, and local honey. They have several drop off locations in Edmonton, Stony Plain, Westlock, St Albert, Sherwood Park, Leduc and Morinville where you can pick up your goods. Located in the County of Lacombe, this family farm grows produce, berries and more. They offer CSA shares as well as u-pick, and all their veggies and fruit are grown spray free. They also have farm fresh egg shares available. I’ve taken my daughter to Prairie Gardens in Bon Accord several times for the amazing family activities they do in the fall. Little did I know they also have a CSA for non-GMO produce! Families in their CSA program can also get passes to their many festivals throughout the year – cool perk! Family garden tucked on the edge of Alberta’s boreal forest, this farm offers heirloom and heritage vegetables, including 100 kinds of tomatoes (I didn’t know there were that many kinds!! ), 12 kinds of carrots, a dozen types of potatoes, and dozens of squash. They have a goal to be 80% seed sufficient by 2018, meaning that they will save and select seeds from their crops. Neat! This farm in Opal offers certified organic produce, and a share includes 2 days of help at the farm so you can take part in the growing and harvesting process. (They do offer non-working shares as well, if that’s not your thing!) They also supply vendors in Edmonton like the restaurants Culina, Corso 32, Elm Cafe, Noorish, Prairie Bistro at the Enjoy Centre, as well as Earth’s General Store. Located near Villeneuve (northwest of St. Albert), this family farm uses sustainable farming practices to grow organic vegetables and herbs. Small family farm outside of Onoway that grows sustainable vegetables, and also have hens, milk goats and sheep. They offer free range eggs with chickens that have unrestricted access to the outdoors. They have several central locations in Edmonton for pickup of shares. Pastured poultry is available in late August. This farm north of Camrose grows vegetables, and herbs from non-GMO seed using organic methods without the use of chemical pesticides or fertilizers. They are not doing a CSA for 2016 but will hopefully be back in 2017. 4th generation farm near Winfield using organic processes to grow a wide selection of vegetables. Members get deliveries weekly to Northgate on Sundays, including a dozen eggs for a 12 week growing season. Note: They won’t be running the CSA program for 2016, but will be posting what vegetables they have available in Edmonton on a biweekly basis, along with eggs and lamb. 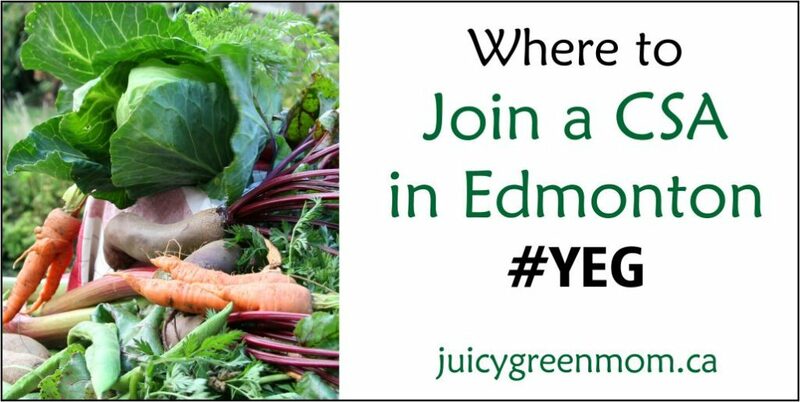 This farm near the Edmonton International Airport offers a year round flexible plan – you decide when to order and pickup from their market locations (Mothers Market, and City Market Downtown). They offer heritage greens and vegetables, potatoes, charcuterie, cornish game hens, duck and duck eggs, geese and guinea fowl, and turkey. This farm’s 2016 CSA program is now open! They also have an organic vegetable operation that includes potatoes, cucumbers, tomatoes, beets, squash, onions, garlic, peas, beans, kale, rhubarb, and raspberries. They also offer weekly deliveries in Edmonton for chickens, turkeys, and pork raised outside with handmade feed. 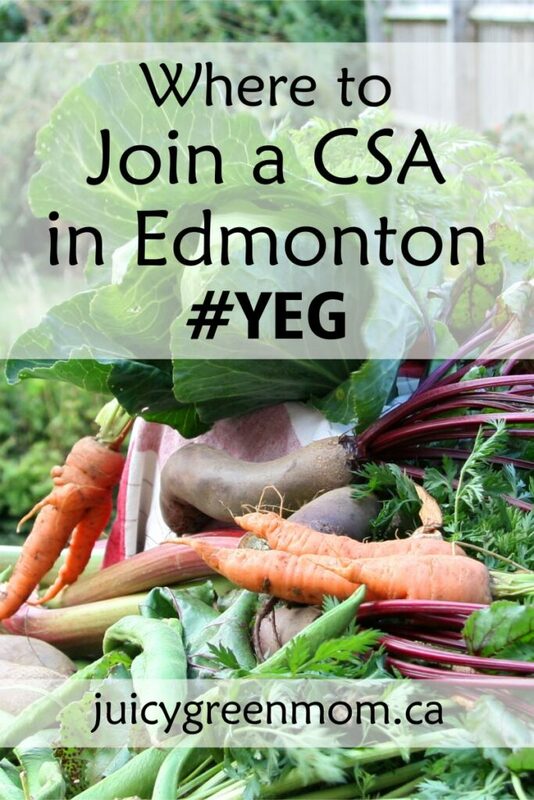 I’m pretty impressed – there are a LOT of options to join a CSA in Edmonton! Will you join a CSA this year?